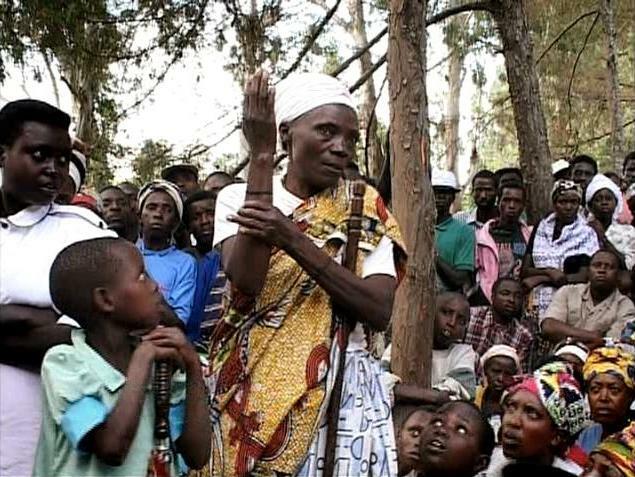 My first major discovery of the Chicago Film Festival is the documentary My Neighbor, My Killer, which will be an insuperably hard sell to lots of audience because it's about the aftermath of the Rwandan genocidespecifically, about the locally mounted communal trials by which survivors of the national massacre accuse, listen to, and sentence suspected perpetrators who have recently been released from jails, once the official courts became hopelessly clogged and the processes of jurisprudence and of healing, whether or not those have anything to do with each other, grew ever slower. The film itself is smartly, profoundly, tough-mindedly evocative of almost every side of this unfathomable circumstance. It is robustly present-oriented, rhyming with the ethos of the courts to help everyone move forward, without getting saddled in the past, even if that's a profoundly impossible edict to maintain in a country like Rwanda. If anything, the film skimps a bit too much on historical and contextualizing information (I recommend Gérard Prunier's The Rwanda Crisis for an incisive and comprehensive historical account), but the film teems with interviews and with snapshots of awkward, enormously loaded personal encounters that I'm sure I will never forget, and not for the reasons I anticipated. Click here for my full review, and keep your eye out for the movie. Please do, by the way, click on these reviews, link to them on your sites, or post comments on these blog posts, even if you don't plan on catching the movie soon or having time to read the full write-ups just yet. It's quite an exercise in generosity when these festivals afford me a press pass, since I'm not connected to any "official" media outlet, and being able to verify that people are reading these entries and taking stock of the filmsespecially the ones you haven't read about elsewherewill allow me to keep scoring gigs like this. Thanks! My Neighbor, My Killer plays Sunday 10/11 and Tuesday 10/20. I don't comment here too much, but I wanted to say that I read your site avidly and am in love with your writing. There are few critics I've read who I find to be more intelligent, insightful, interesting and ego-free. So, thank you for writing and please don't stop. I will be at the festival tomorrow for as many "rush" tickets I'll be able to get. And then again, next Saturday. Hope to catch this one as well, if at all possible. Oh boy, your reviews of My Neighbor, My Killer and Paranormal Activity have got me psyched to watch them both. Dare I say your writing has surpassed itself, which is quite a feat? I shrieked with laughter at how you peppered your Paranormal review with modulated examples of your own bodily horror as you mustered your memories of the film. This write-up might have been enough to convince me to try for the 10/20 screening, and skip the free surprise event (which was just so swell last year. RocknRolla. Gee, thanks, Fest programmers). @Adelutza: Good luck with those rush tickets! Tomorrow, of course, is the one day in the entire festival that I expect not to be there. @Colin: Thank you, too, for such kind words and for being such a regular and thought-provoking commenter.